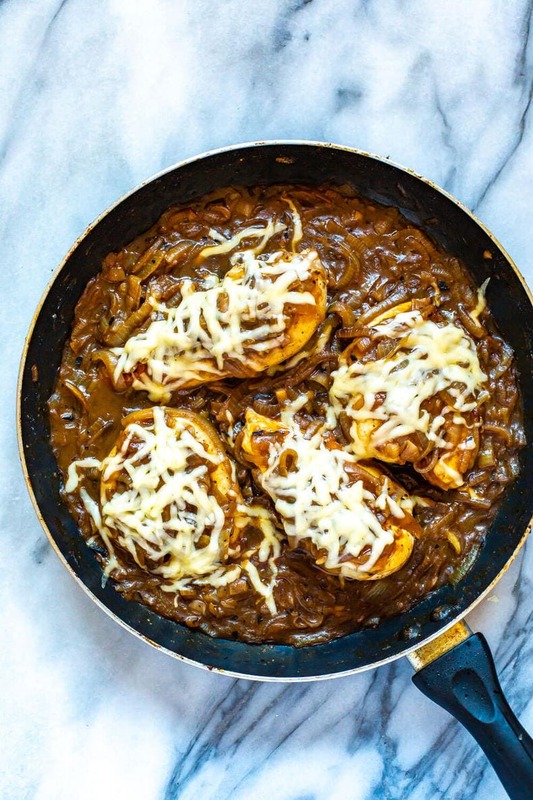 This French Onion Chicken Skillet is a delicious weeknight dinner that is a play on French onion soup and packed with protein, making it a full meal. This will become one of your favorite chicken skillet recipes! What is French onion chicken? If you know what French onion soup tastes like, you're on the right path to know what French onion chicken is. This easy skillet dinner starts with juicy boneless, skinless chicken breasts. The chicken, smothered in cheese, sits in a buttery bath of caramelized onions and rich gravy. This one-pan meal prep chicken is pure and simple comfort food that's still fairly healthy – BONUS! 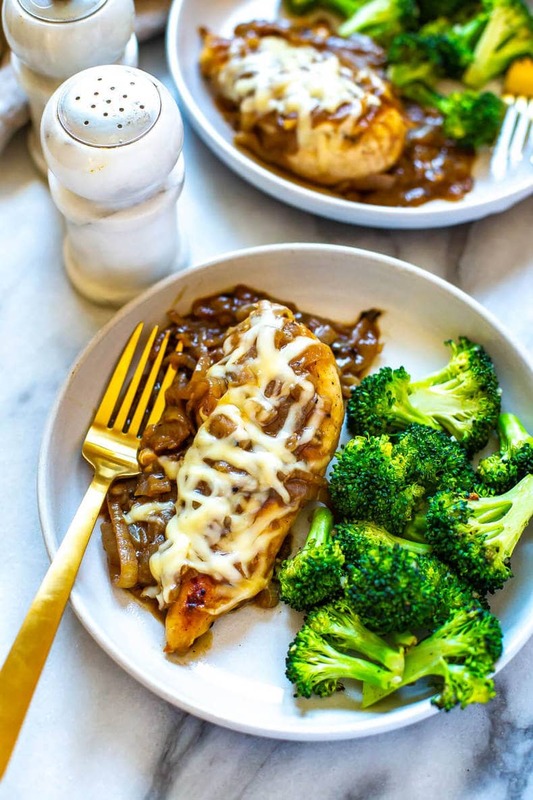 Skillet French onion chicken is incredibly quick to make, cooking up in just 30 minutes, making a family weeknight dinner that everyone loves! Do you know why onions make you cry? It's all very scientific and to be honest, sort of interesting (in a geeky way). Apparently, onions have a built-in defense mechanism; their enzymes! Those sulfuric enzymes, coming from sulfur in the soil, produce an acid that breaks down quickly into two gasses: thiosulfonate and syn-propanethial-S-oxide. The first gas is responsible for that awful onion smell and the latter is a volatile gas that stimulates the glands above our eyelids to make reflex tears. Do your eyes burn and water when you slice onions? Depending on how much sulfur is in the soil, some onion varieties will have a milder effect on our eyes than others. Anyway, here are a couple of simple kitchen hacks to teach you how to cut onions without shedding tears. To scatter the sulfur compounds, turn on a fan while cutting onions. Chill onions before chopping them. Just toss them in the fridge in the morning, peel and all. Use an onion chopping container. Of course, you can always throw on a pair of swim goggles or sunglasses to keep those nasty enzymes away from your eyes, too. Can you freeze leftover French onion soup chicken? While it can be difficult to freeze leftover French onion soup because of the cheesy crouton floating on top, this skillet French onion soup chicken freezes beautifully! That is why it's so perfect for meal prep dinners; you just need some meal prep containers and you're good to go! Of course I prefer to store it in the fridge up to five days as that's the easiest way to enjoy it as meal prep. 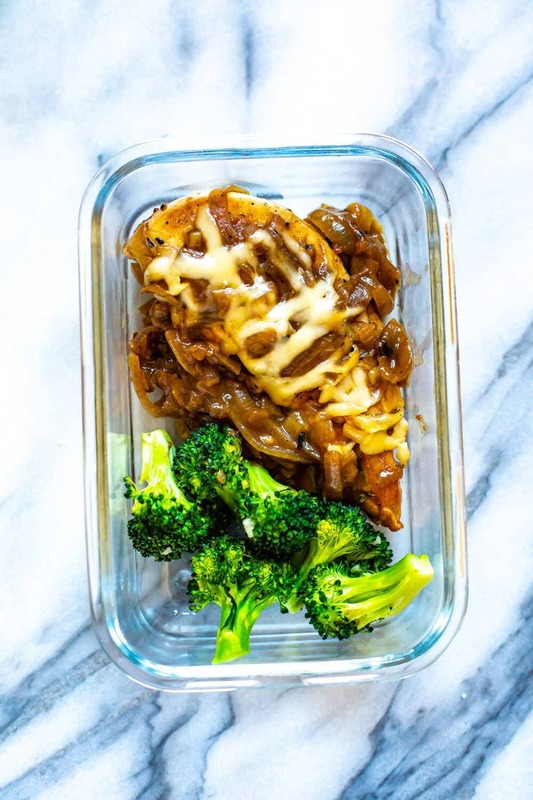 Usually what I will do is make this French Onion Chicken for dinner one night and then eat the leftovers for lunch the next couple of days. That's the best way to really enjoy your meal prep efforts without having to eat too much of the same dish during the week – eat your dinner leftovers as lunches! 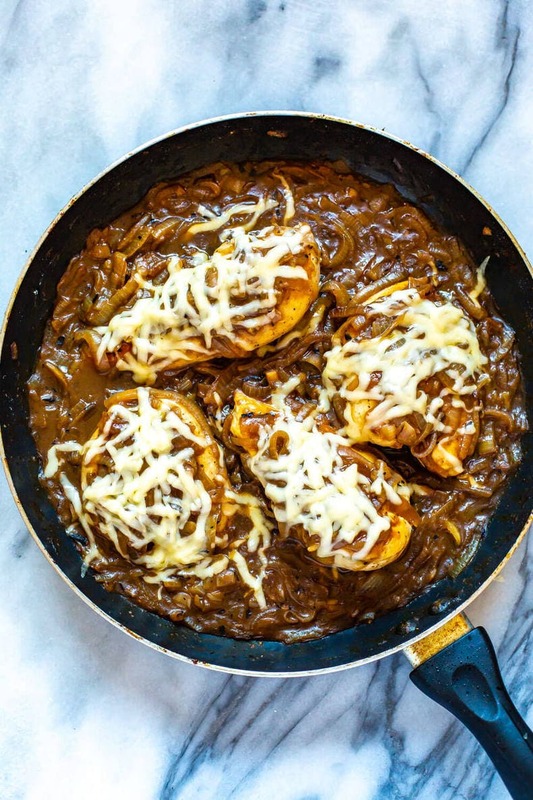 What goes well with Skillet French Onion Chicken? With a versatile chicken skillet dinner like this one, options for sides are pretty limitless. Make a veggie that your family likes. Steamed broccoli, green beans, or carrots are great choices, as are starches like rice or potatoes. 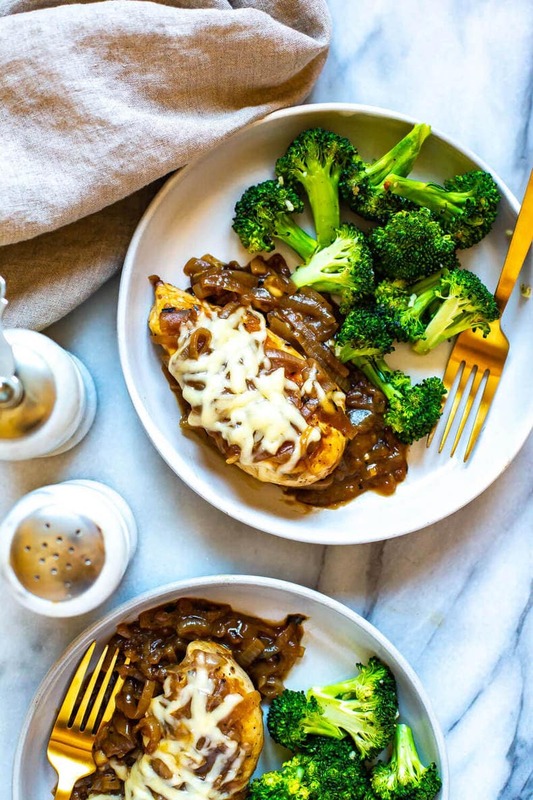 Oh, and of course, a crusty loaf of French bread would be perfect with a comfort food meal like this French onion chicken, too. Worst comes to worst, you can always do some frozen fries on the side, or some sweet potato tater tots as I like to do occasionally. A salad also pairs really nicely with this dish and keeps it low carb. 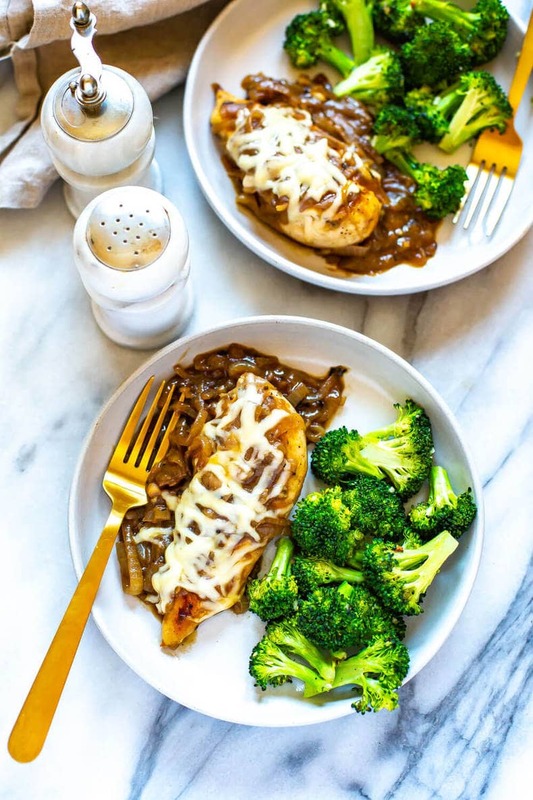 Now the cheese that is best served with French onion soup or French onion chicken is DEFINITELY a nice Swiss cheese – I usually use the Jarlsberg brand, and Emmental is another delicious, mild cheese that would pair nicely with this chicken. You ideally want a cheese that melts nicely and is relatively mild to highlight the gravy and onions. You could also use pizza mozzarella if you're in a pinch! 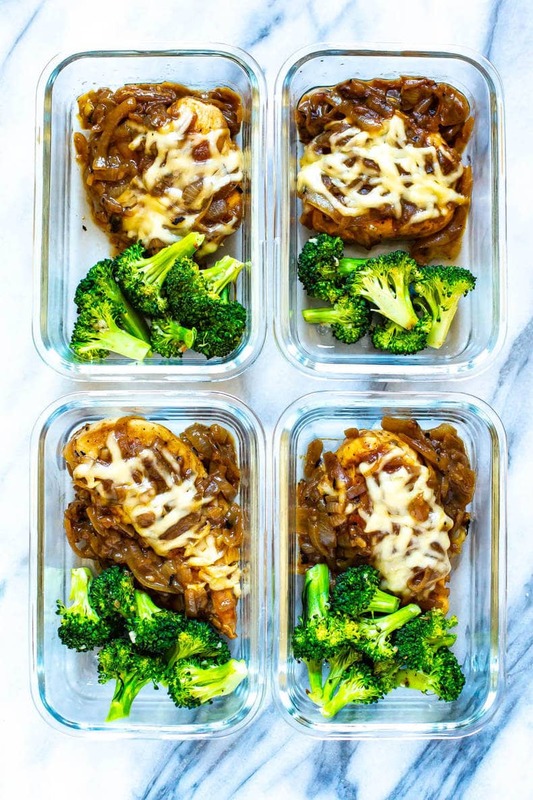 Grab some glass meal prep bowls if you plan on turning this French onion chicken skillet meal into your lunches for the week. 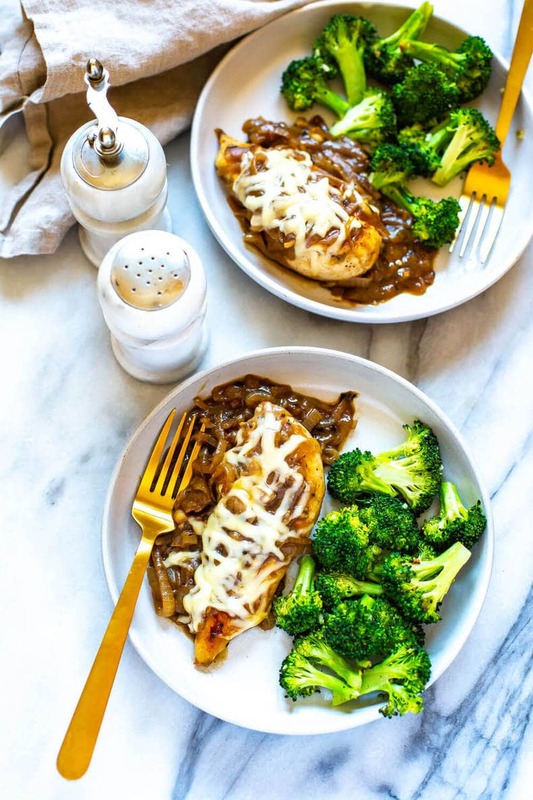 This French Onion Chicken Skillet is a delicious weeknight dinner that is a play on French onion soup - that's right, your favorite winter comfort food is now packed with protein, making it a full meal! Preheat oven to 425 F. Add 1 tbsp olive oil to a large skillet over med-high heat. Meanwhile, slice chicken in half lengthwise then season with salt and pepper. Saute chicken for 4-5 minutes each side, then remove from heat and wipe pan clean with a paper towel. Add 1 tsp olive oil to skillet then add onions and cook for 10 minutes, stirring occasionally until onions brown. Meanwhile, toss broccoli with 1 tsp olive oil, garlic, salt and pepper on a parchment-lined sheet pan. Bake for 8-10 minutes until broccoli is tender. Once onions are softened and somewhat browned, mix in flour and then add red wine and beef broth, mixing well to combine. Add chicken back to skillet and cover with onion mixture, then top with cheese and put lid on top of skillet to let cheese melt, about 2 minutes. Serve chicken with broccoli and enjoy!